I've been doing a bunch of press lately, so let's start at the beginning and when we get to the end we'll stop. First, I did a lengthy interview for the Hello, Sweetie Podcast. You can listen to it here. We covered everything under the sun, including the books and, of course, Star Wars. "Young displays here both his depth as a writer and passion for the art itself--much of which he traces back to Kurt Vonnegut. In a chapter devoted to teachers, Young recounts both experiences in his own public schooling and his feelings for Vonnegut as a passive teacher of sorts. Young also touches on the incredibly personal and political, recounting painful dealings with the US "health care system." There's a little bit of everything in here. And something for everyone. And at $3.99, it's hard to go wrong." You can pick it up digitally now or pre-order the print copy for it's release next month. This is me with Terry Burden, discussing MAD Magazine's 5 Dumbest People, Places, and Things of 2011 on my regular guest spot on Park City TV. Yes. 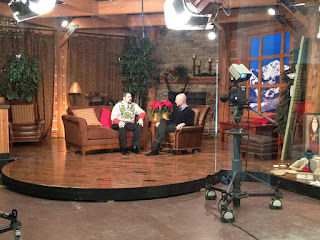 I'm wearing a shirt, tie, and Boba Fett hoodie.There's nothing wrong with flying a geek flag, even on live television.